Illusion Picture, a photo by eddyraymagic1 on Flickr. Illusionist and Magician Eddy Ray's magic shows are filled with unique and memorable moments that have captured the imagination of kids and adults all over the world. If you'd like free information on how Magician and Illusionist Eddy Ray can make your event one to remember, please call him now 1-877-297-7252! Magic Town TV Show 5, a photo by eddyraymagic1 on Flickr. This picture is from Magician Eddy Ray's Magic Town TV Show! You can see the smiles and excitement in this screen capture during a live broadcast of the show. 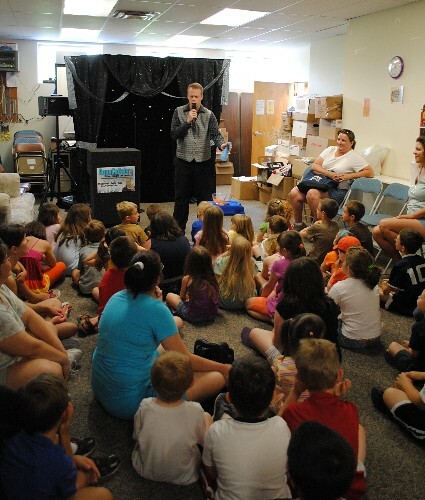 Magician Eddy Ray has the perfect magic show solutions for child care centers, schools, libraries, camps and more! Contact him now for future information on how you can get his amazing magic show into your facility! Illusionist and Magician Eddy Ray can amaze young and old! 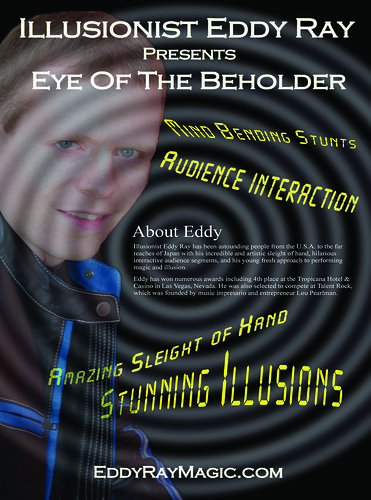 Eddy's shows feature illusion, sleight of hand magic, comedy, audience interaction, mind reading, and music! 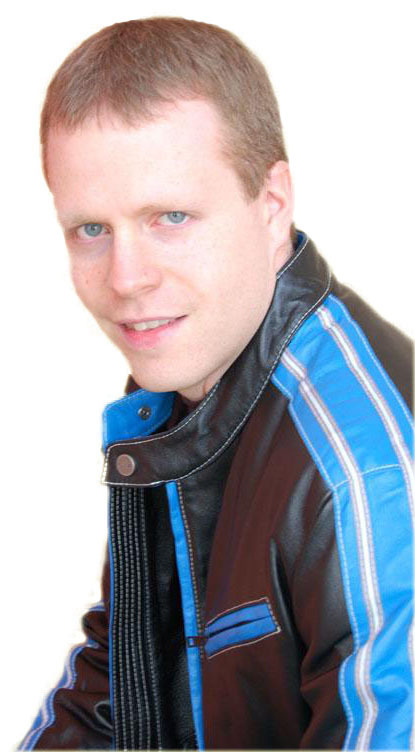 Visit PA Magician Eddy Ray Here for futher info on how he can help make your event memorable! Promo Flyer Magician Eddy Ray, a photo by eddyraymagic1 on Flickr. Need a family fun and unique entertainment experience for your upcoming event? Magician Eddy Ray has the perfect solutions for you! Incredible magic shows featuring sleight of hand, comedy, illusions, mind reading, and more. Contact him now for free info! The Magic HotRod is one of the most effective props in magic you can own! Eddy Ray’s teaching will take you step by step into the world of the Magic HotRod. Add over 30 Tricks & Tips to your arsenal! Join Eddy Ray and learn amazing magic with this incredile hot rod. It fits in your pocket and is the perfect effect for the close up, strolling and walk around magician. Here is a sampling of what is included on the teaching DVD! In this video, Magician Eddy Ray has help from an audience member to try and perform a unique card trick. Visit Eddy Ray at, PA Magician here. Magician Eddy Ray Performing at a Christmas Event, a photo by eddyraymagic1 on Flickr. Check out this interest magic trick from the creative mind of Magician Eddy Ray! Just some magic performed by Magician Eddy Ray outdoors! Eddy is known for his skill in sleight of hand magic. Check him out here. Magician in Pennsylvania . He offers many unique entertainment options from stand-up magic shows to strolling close-up magic! Perfect for kids and adults, contact him today! Video Testimonials, a set on Flickr. Written testimonials are good... video testimonials are even better. Check out what this teacher thinks of Magician Eddy Ray's Amazing Magic Shows For Students! Magician Eddy Ray in Illusion Show 7, a photo by eddyraymagic1 on Flickr. From the archives. This picture you'll find Magician Eddy Ray performing a show for Alex's Lemonade Stand. This trick is called Zig Zag and it pretty much speaks for itself! Magician Eddy Ray is seen here lecturing and performing magic in Japan, 2006. For more info on Magician Eddy Ray visit his website. Pennsylvania Magician or here PA Magician For Kids and Adults . 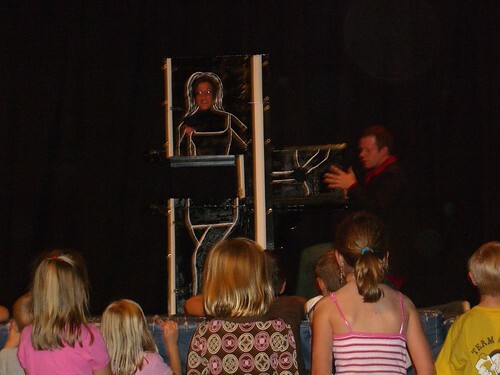 Visit Eddy Ray, The Busiest Magician in Pennsylvania For Kids and Adults. Eddy has the perfect magic show solutions for any event or party! Make it magical and memorable. Visit his website for more info today! - Jack & Sandy Neal – Lancaster, PA.
Magic Show By Eddy Ray, a photo by eddyraymagic1 on Flickr. Want to pack your library full of excited kids? Hire Pennsylvania Magician Eddy Ray! He has magic shows and themed programs that will help make your summer reading program a smashing success! Card trick performance by Magician Eddy Ray from his Mental Photography Deck DVD. This is just one trick of several you can learn to perform too! 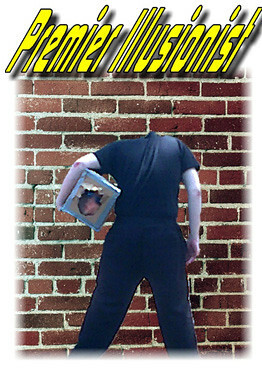 Visit http://www.magictrickpro.com to find the DVD! Visit Eddy's site at Magician Eddy Ray . Mini CD's appear over and over again.. being split from one into two! Magician Eddy Ray's sleight of hand with CD's has taken him all over the world. Now you can learn how to perform cd magic! Visit, MagicTrickPro.com . Video from the past in today's new blog post! 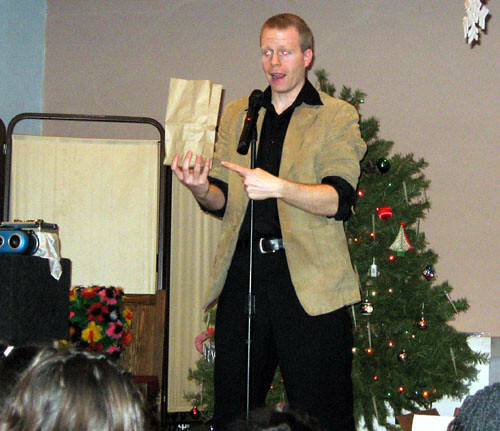 Magician Eddy Ray is seen here in 2004 (?) 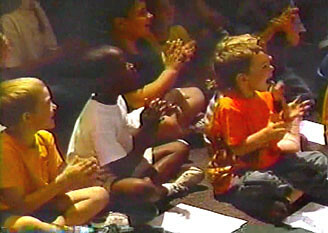 performing in his own television show called " Magic Town" which aired on BCTV. Enjoy! Find out more info on Pennsylvania's Busiest Magician here: Magicians in Pennsylvania . Here is a video shot back in 2006 of Magician Eddy Ray performing complex sleight of hand magic! In this video Magician Eddy Ray performs amazing sleight of hand with cards, compact discs, and more. Eddy Ray at Grasso's Magic Theater Coming Soon! Come out and be a part of Eddy’s Amazing Magic Show for kids and adults! The magic show will be held on Sunday July 24th, 2011 with a showtime of 3pm. The location of the show is Grasso’s Magic Theater in Philadelphia, PA.
Magician Eddy Ray will present a one hour family fun magic show with sleight of hand, comedy, amazing magic, music, and more. All ages are welcome.